James Cockshutt started the Brantford Plow Works in 1877 and built a number of different models of plows along with other products. However as Western Canada opened up to homesteaders in the 1880s, James Cockshutt found that plows designed for Eastern Canada were not completely suitable for the prairies with its blanket of tough wild grasses possessing a thick root mat. So Cockshutt designed a single bottom riding plow that possessed a stronger frame than eastern plows plus a moldboard with curvatures designed for prairie sod. The best way for a plow to cut into sod or dirt while, at the same time, lifting and turning the material over through 90 degrees is with a moldboard that possesses a spiral curve across the face of the moldboard. The properly curved moldboard would result in reduced draft or tractive force necessary to move the plow and so result in economical plowing. To complicate matters a different spiral curve is required for the moldboard to efficiently cope with the different soil types, depth worked and working speeds encountered plus produce the appearance of the plowed field that the plow man desires. Differently curved moldboards were then needed for clay, sand, sod, corn and wheat stubble, the slow moving breaking plow and so on. From the day of introduction the JGC riding plow was a success in Western Canada and was in the Cockshutt catalogue from 1884 to 1931. Only limited changes were made during this time such as using built up spoke wheels instead of cast wheels and a steel pan seat instead of a cast iron seat. The Museum has a number of JGC riding plows in the collection including the early plow with cast wheels and a cast iron seat that is seen on this page. 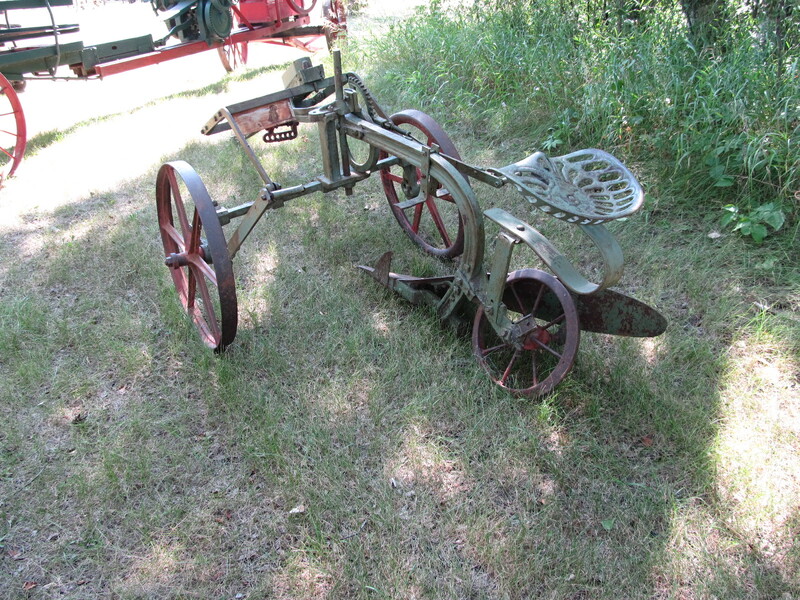 This plow was donated to the Museum in the mid 1950s by L. Smith of Brandon. Other JGC plows in the collection have pressed metal seats and / or different wheels. Soon after the JGC was designed, James Cockshutt passed away due to tuberculosis, a very common illness at the time and one for which no treatment existed at the time, other than retiring to a dry climate. As the Cockshutt family had been aware of James illness, the Brantford Plow Works was reorganized into the Cockshutt Plow Company and one of James brothers took the helm of the company before James passed on. Cockshutt went on to build a large number of plow models, as many as 130 as well as a number of other tillage tools. Cockshutt began building swathers, tractors and combines after World War 2. Cockshutt branched out into other products such as wagons and truck bodies as well. It is interesting to note Cockshutt during World War 2 built undercarriages for aircraft, aircraft engine exhaust components and the moulded plywood fuselages for Anson training aircraft and for Mosquito fighter bombers.